Previous owner Larry Wood had been associated with San Diego Boat Movers for 41 years when he retired in November of 2011. As a young man, while working as Travelift operator at Kettenburg Boatyard on Shelter Island, he became acquainted with Jim Reeder, the original founder and owner of San Diego Boat Movers. Reeder hired Larry, taught him the skills of loading and unloading a boat (often manually) , and taught him to drive the big trucks. 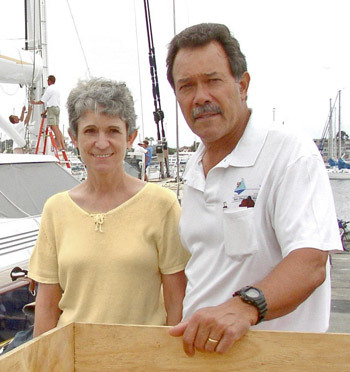 SDBM has had various owners over the years, and in 1980 Larry and Gil Gresoro became the fourth owners. In 1999 Larry bought Gresoro’s share of the business and became the sole owner. Larry has been around boats most of his life. He was born in San Diego in 1945 and grew up on Pt. Loma. He attended local schools, including Point Loma High. As a child his father managed the San Diego Yacht Club for a number of years. Larry, his mother and father, and his younger sister Dianne lived for a few of those years in an apartment over the Yacht Club’s main building. After that they lived in houses on the Point. Larry spent much of his time at the Yacht Club, learning to sail and gaining knowledge about various boats. After high school Larry graduated from San Diego State University with a degree in business. Larry married his high school sweetheart Cristie Sims and they have a daughter Lorna and a son David. Larry and Cristie have three grandsons and one granddaughter, with another grandson on the way. His son David spent summers working at the SDBM boat yard, as did his older grandsons, Brett and Jon. Cristie has worked off and on in the office. Throughout Larry’s career he has overseen and participated in the transporting boats ranging in length from 20’ to 140’, including Americas Cup contenders, high-tech racing sailboats, large custom yachts, Navy vessels, and specialty boats. He even built a steering stretch-trailer to transport 180’long masts across the country. Larry’s customers could always count on Larry to handle their boats with the utmost care. He always paid precise attention to details, ensuring the job was done in the safest way possible. The names San Diego Boat Movers and Larry Wood became synonymous for integrity and professionalism. Up and down the West Coast and even to the East, he has created for San Diego Boat Movers a reputation with their customers as a company you could rely on. In retirement Larry still enjoys participating in some of the company’s challenging moves.